In Romania we are mostly Orthodox Christians so this year we celebrate Easter a week later than the Catholics. That is why this Easter related post comes now and not a week ago. I will not go into detail, pointing out the exact day in which Romanians are dying their Easter Eggs, because of course there is a certain day. 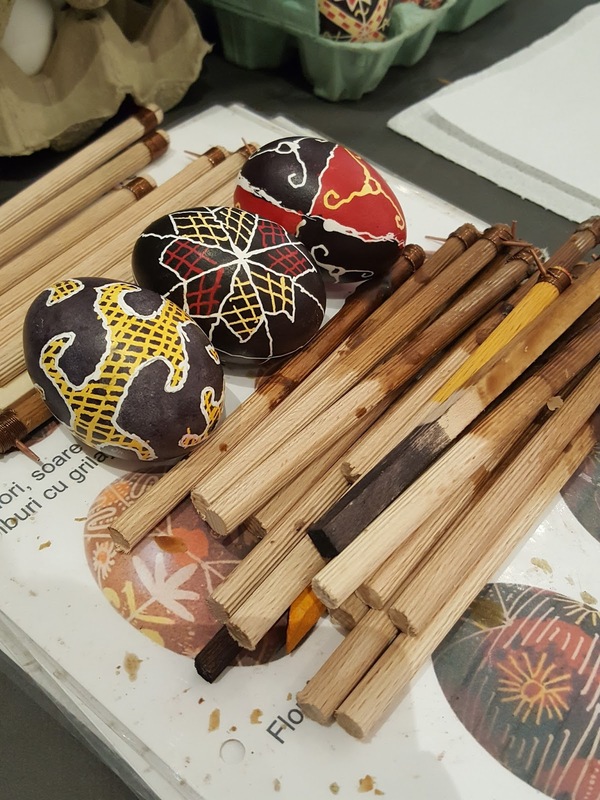 Here in Luxembourg we had the chance to learn how to dye our Easter Eggs the traditional way, because Sebastian Paic a well known Romanian ethnologist came to teach us. I will lead you through the whole (or most of the) process with pictures and at some point, God willing (:D), I will have a video from Sebastian's workshops. You will find it on my fb page, Dichisuri.ro. When we dye (for the sake of it I will use the term write or colour, because the terms in Romanian are exactly that), SO when we write on the eggs we (of course) use a pen. It is basically a copper wire wrapped around a wooden stick. BUT don't go making one for yourself, because there is a secret behind the thickness of the copper wire. Also when we write on the Easter Eggs we don't just draw meaningless symbols, everything has to have a sense. That particular egg is from a museum close to Luxembourg, in Brussels (if I remember correctly), at the end you will see my funny attempt to reproduce it. Sebastian had, of course, eggs coloured by him on display, so we could get a better understanding of the whole process. We coloured white empty eggs. Why empty? Because they can now be kept as decorations, as souvenirs from a lovely afternoon. The whole process is interesting, you have to think two steps ahead, and think in layers, because after each layer of paint, you cover the pattern you want to be left in that colour with beeswax. And this is my final product, at least I understood the techniques. Keep an eye on my Instagram as I will most probably post there my eatable Easter Eggs. 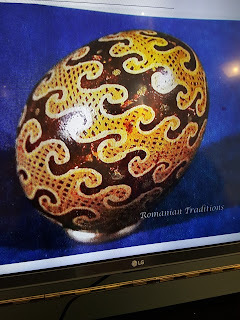 SO, there you have it, writing on Easter eggs the Romanian way! I hope you loved reading this post as much as I loved putting it together! ALSO, if you fancy keeping in contact with me, drop a line at Dichisuri.ro on Facebook.